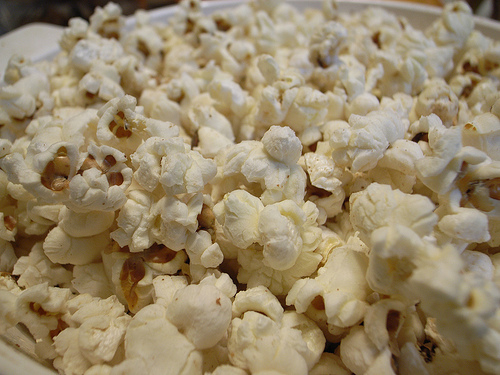 Food Costs > How Much Does Popcorn Cost at the Movie Theater? How Much Does Popcorn Cost at the Movie Theater? Buying popcorn at the theater is almost a given. Unfortunately, the cost of the popcorn has doubled since 1929, when its price was extraordinarily affordable and every person could buy huge quantities without investing a lot of money. As the time went by, the pre-inflation price increased and the overall price of the popcorn became higher than ever. If you compare theaters, the price of popcorn ranges a great deal based on the city, the theater chain and the amount of popcorn that you want. Some places might sell it for only $3, while the other will charge you $4.75 or even higher. On average, plan on paying $6 to $10 for a large tub of popcorn, while a small tub will cost you about $4 or so. Why is the price so high? Movie theaters have been said to make very little from the movie due to the licensing fees, and chains can see an 85 percent profit at their concession stands, contributing to close to 20 percent of the gross revenue. To stay in business by paying rent, utility bills and their employees, the money, sadly, has to come from somewhere. NOTE: These are just averages and can vary by a dollar or so at your location. According to this ABC News report, the average tub of popcorn at a movie theater costs more per ounce than a filet mignon. They state the average small bucket of popcorn will usually cost $5.50 or so. Popcorn is usually served in three different sizes at most movie theater chains, including a small (around 44 ounces), a medium (around 85 ounces) and a large (around 170 ounces). If you go to the movies a lot, consider signing up for their frequent movie-goer cards. These cards will often reward you with free popcorn and other rewards. Almost all theaters will offer free refills on the popcorn you purchase but only in the largest size. Some theaters will limit it to one refill while others will offer unlimited. Combos are often readily available and can bring the costs down if you were to combine drinks and/or other food items. Before going to the theater, go to the movie theater’s official website to see if they have any promotions available on either their official website or social media page. Some even offer a deal if you sign up for their email newsletter. if you get the large you get free refills on anything that you bought during that day and on Tuesday’s have $5.00 movies and if you buy a large popcorn you get a free little cup of popcorn.